Large 200cm Country oak sideboard. Lowest UK price guaranteed. 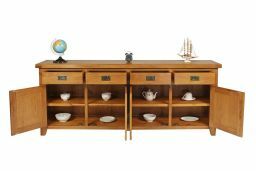 A huge sideboard with masses of storage space made from premium grade American oak sourced from managed sustainable forests. 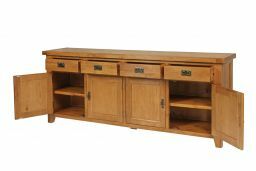 This is one impressive piece of furniture that will add the wow factor to your home. The storage potential that this sideboard offers is incredible. 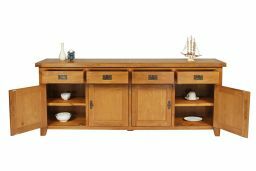 I have een looking for a while for a sideboard this size, and without seeing it in "person" I was concerned, but there was no need, like the storgae shoes bench, both are beautifully made and look fabulous. A bonus, they said they woud deliver at 08.30 am, and I was cynical, but happy to be proved wrong, at 08.30 they arrived, couldn't ask for better service or product. Lovely item. Great value car money. Arrived in perfect condition. 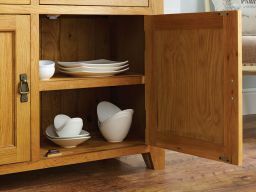 A beautiful piece of furniture that sets off the dining room perfectly. And the two guys that delivered it were very professional. For such a large piece of furniture they were in and out in a matter of minutes. 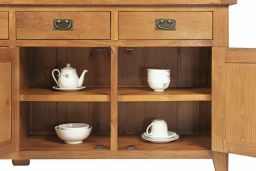 Very nice piece of furniture which goes well with my previous purchase of a very large extending Country Oak dining table and eight dining chairs. Only let down by delivery: unannounced at 5.55am, carried to room and placed, as it turned out, with cupboard doors facing the wall. No help unpacking (previous table was unpacked for a consideration but was told this was not possible this time). When I asked how I was supposed to get it out of the box I was told to cut the box open all around then drag item out forwards - as stated they had placed the box facing the wall so this was a challenge...fortunately room is big enough to drag it around. Was told to phone driver in case of any problem, however no paperwork or number, so after a trip back to van I had a mobile phone thrust in my face for me to write down the number displayed. Very nice piece of furniture, as I have come to expect. Rotten start to day though.. The table itself is as expected. We are happy that the quality is as advertsed. I was disappointed that the delivery service did not include unpacking and removal of shipping materials. Excellent quality and great price. Communication good. Will certainly buy again. 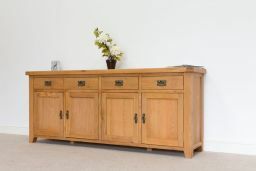 Lovely sideboard, very professional delivery men. Good communications as to when they were delivering the sideboard. All in all a good experience - will definately use these guys again. Fantastic customer service. Excellent quality furniture. 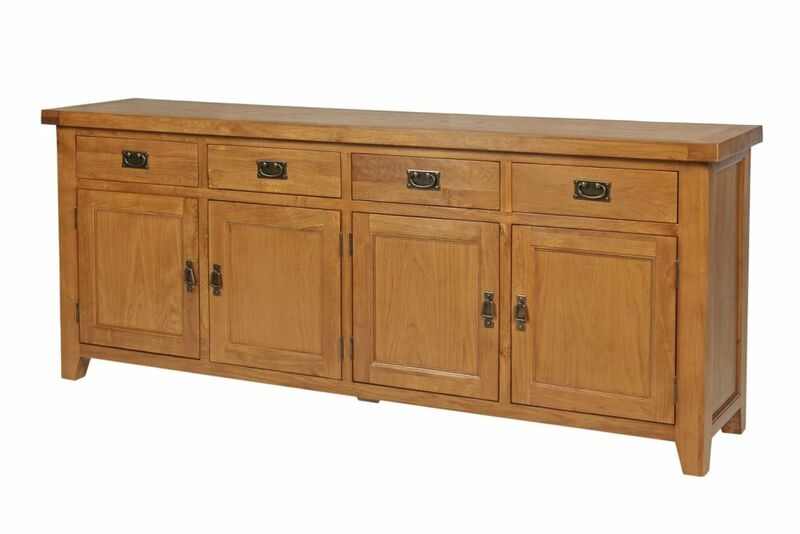 I ordered a beautiful extra large sideboard and it is gorgeous. Will order again!!! Delivered on time. Good communications. Excellent quality. Will certainly use Top Furniture again. Recommended. 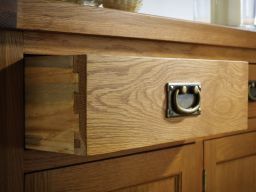 This is a lovely piece of solid oak furniture and we are very pleased with it. Lots of storage space. Arrived well packed. Highly recommended. Wow. Love it to bits. Certainly bigger than any others that I have viewed and at a better price, value for money. The guys delivering it were great, nothing too much trouble. Very happy. Excellent piece of furniture. Great quality and lovely size, worked so well at Christmas with a protector on it it had so much space for hostess tray, plates, cutlery etc. It certainly is great value for the money. Very well packaged for delivery. Absolute hit with me and highly recommended. We already have country oak bedroom furniture that we purchased 12 moths ago. We are very pleased with the quality and finish of all of the furniture. We would recommend the furniture without hesitation. Beautiful piece of furniture and very well priced! Was in stock so delivery was very quick. Delivered early in morning for us as agreed before I went to work which was very much appreciated. Very well packaged and in perfect condition. Looks brilliant in our sons playroom, great place to store his toys, etc. Would definitely recommend this item and also this company. First class. Thank you. 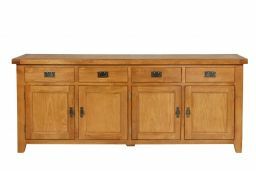 We are very happy with our new sideboard. It is just what we needed for more space in our new bungalow.it looks lovely and the only reason it has not got 5 stars is that none of the shelves are adjustable. But nevertheless it is lovely. 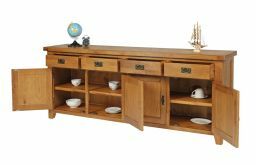 This sideboard looks lovely in our dining room. It is really well made an an excellent price. Bought this to match our table we brought earlier in the year. Good quality piece of furniture and reasonably priced. Lovely addition to our new house. 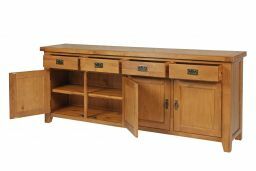 I must say I wasn't very sure how this sideboard would be as have never bought anything from Top Furniture before. 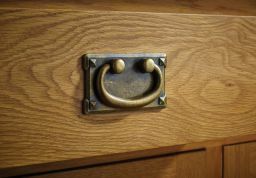 The product is good quality, solid oak, and goes well with my furniture. I think it is good value. Excellent quality for the money. Arrived earlier than anticipated despite being in the 'highlands and island' postcode category! Well packaged. Would use again. I have just had this delivered today along with nest of tables from same range and I'm absolutely over the moon. The quality and finish of the unit is second to none. I bought these to match the cross legged dining table that I bought last month, because I was so impressed with that and I'm delighted with everything. This furniture is beautiful, solid and the quality and finish is superb! The prices are unbelievable for such quality pieces of furniture. I can't recommend this range of furniture highly enough.....it's absolutely stunning! A lovely piece of furniture safely delivered in perfect condition. Overall we are very pleased with the price/build quality. Recommended!! 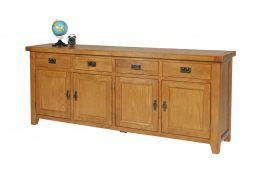 Nice sideboard good quality having a large warehouse means the goods are in stock and you can take immediately and not wait weeks for delivery like some places.